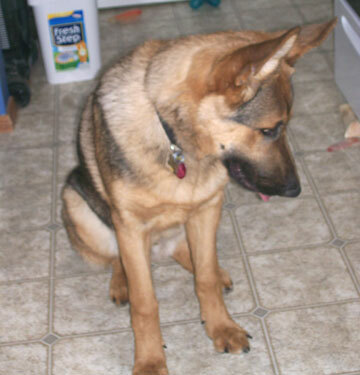 Brandy was a beautiful black and tan female GSD. When she was a little pup, I saw her approach the front door and stick her head out. She saw that it was raining, (she didn't like the rain), so she happily trotted to the BACK door to exit there instead. She figured that it wouldnt be raining in the back yard. I said, "Brandy, you big giant dumb dumb. It doesnt matter which door you leave out of. If it's raining, it's raining everywhere." She just tilted her head during my explanation and pretended to understand.